As suggested by the images of this Euro-spec model, the Superb is likely to undergo just a mid-cycle refresh with a few cosmetic upgrades. While the updated Skoda Superb has been caught testing quite a few times now, fresh images have surfaced online which reveal the updated car without any camouflage. This means that the Superb's next iteration is nearing its launch. Well, based on the images, it is safe to assume that it will only be getting a mid-cycle refresh with a few cosmetic changes. While the side-profile remains near-identical to the current version sold here, it's the front and rear which gets the bulk of changes. Overall, the updated Superb features a fair bit of styling equipment from the newly-introduced Skoda Scala hatchback. Both models share similar-looking LED headlamp units, which have come in exchange for the current Superb's round-projector units. Other changes at the front include a restyled bumper which plays host to a wider air dam. Even the fog lamps are now of a wider, sleeker design. At the rear, the most prominent change comes in the form of the iconic Skoda badge getting replaced by the spread-out 'SKODA' lettering. This change, once again, made its debut on the Scala. While the taillamps seem to be untouched, a chrome strip now runs across the boot lid which cuts through the taillamp units on either side. Also, the lower profile of the bumper seems to have been revised. It has been reshaped and gets a faux vent on either end. As of now, there are no confirmed details about any powertrain changes, but sources suggest that the update could include a hybrid powertrain. 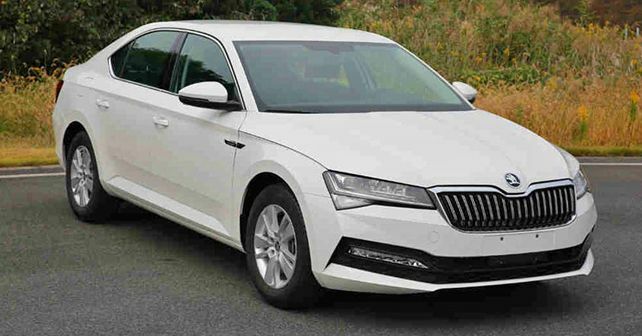 In India, Skoda could offer the updated Superb with a 12.3-inch Digital Virtual Cockpit, which is already seen on the Kodiaq and the Octavia. The Superb facelift will most likely make its global debut at the 2019 Geneva Motors Show in March this year and its arrival in India is expected to be in the latter half of 2019.